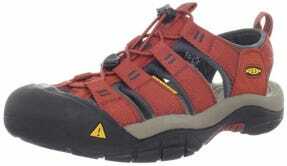 At time of posting Amazon has most KEEN Men's Newport H2 Sandal sizes available for just $75.00. That's the lowest price I've seen on them this year. Colors available at the $75 price are Burnt Henna/Dark Shadow, Black Olive/Bombay Brown, and Gargoyle/Garden Green. I'm wearing a pair of Keen trail runners that I love right now and didn't hesitate to jump on this deal for myself.